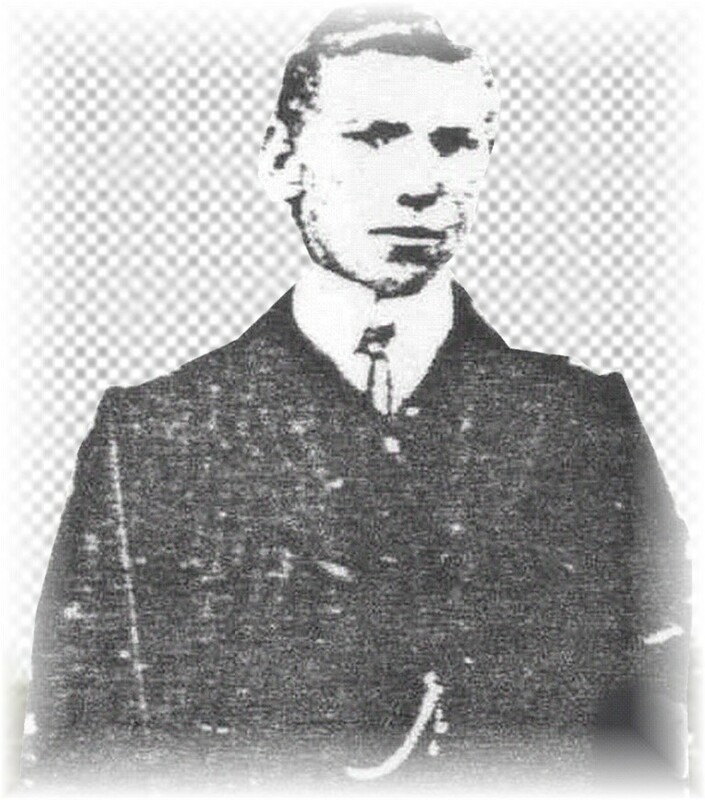 LESLIE HENRY TRUMPER was born 23 Feb 1895 in Temuka, the son of Benjamin Trumper (1854 - 1931) and Elizabeth (Lizzie) Benbow (1859 - 1931) and died 9 Sep 1952 in Fairlie aged 57Y. Les was a member of NZ Territorial Force. Set up in 1911, enlisting was compulsory as the likelihood of war breaking out in Europe was foreseen. It involved attendance at rifle practices, parades etc, for ages 18-25. Under 18s were enlisted as cadets, and men over 25 were enrolled on the active/reserve list (for them, attendance was not compulsory). Timaru Herald, 4 June 1914 TEMUKA TERRITORIALS: ANNUAL SHOOTING MATCH: The Temuka Territorials fired their annual shooting match on the range, Temuka, yesterday. Line distances were 200 and 500 yards and the conditions 7 shots at each range. Captain Henderson, musketry instructor for the district was present, and considered the shooting on the whole very good. At 200 yards the conditions were favourable to good markmanship, but later, when firing at 500 yards, a heavy squall came up, with the result that the most reliable scores met with very poor success, and the scoring dropped considerably all round. "Temuka Leader" announced "The auxiliary contingent left 12 December 1914 by the second express with entrants from Winchester - D. Ferguson; S. Cliff, and W. McClelland; from Milford, Maze and Private Trumper; Serial No. 6/1741, Unit - Canterbury Infantry Battalion. Lesley arrives home on 6 Jan 1916 to New Zealand after a year away but remains in Auckland. "25 CANTERBURY MEN (names were published) are suspected of being "carriers" of enteric - Lesley is among them. Solders were dispatched immediately off the Troop ship "Maheno" to the isolation camp attached to the Auckland Hospital. (Typhoid_fever (commonly called "Trench Fever" spread by ingestion of faecally contaminated food or water - poor hygiene and lack of sanitation caused many deaths and much debility during the war period.) 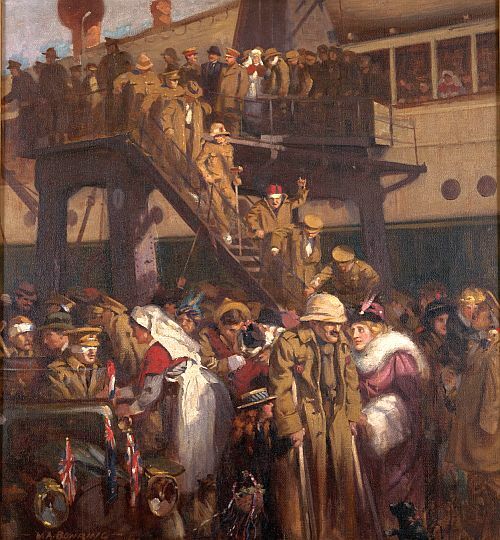 The homecoming of the Maheno from Gallipoli was painted by Walter Armiger Bowring in 1916. Four months later Lesley is discharged and his family is able to welcome home a frail and wasted shadow of the fit and able man they had farewelled. Timaru Herald, 25 June 1917: MILFORD. There was a very large-attendance at the Milford School on Friday evening, to welcome home returned soldiers Messrs' G. Aepinal, J. Horgan, L. Trumper and A. Gason. After dancing had been indulged in for some time, a concert party from Geraldine, under the leadership of Mr McGregor, arrived, and gave a few enjoyable items, that were much enjoyed during a break in the proceedings. Mr Robert Macaulayf on behalf of the Patriotic Committee and the Milford residents welcomed the returned troopers and presented each with the committee's medal of honour. Mr John Kennedy, of Geraldine and Mr T. Giinhion also spoke, and Mr J. Horgan suitably replied. Lesley married on 12 Sep 1917 HAZEL ALPINE DOUGHERTY daughter of WILLIAM DOUGHERTY and her mother SARAH McCLINTOCK. Hazel was born 17 Dec 1896 in Temuka, and was living at the Wallingford Home at Temuka at the time of her death 01 Feb 1989. Lesley helped his father Benjamin farm the property "Riverslea" and there, they altered the large house into two flats to accommodate both families. Les worked there until his father died then later moved to the Fairlie district to farm.